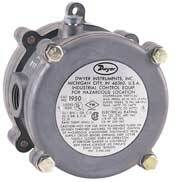 Model 1950 Explosion-proof Differential Pressure Switch combines the best features of the popular Dwyer Series 1900 with an integral explosion-proof and weatherproof housing, making it an exceptional value for either application. It is CE, UL and CSA listed, FM approved for use in Class I, Div 1, Groups C and D, Class II Groups E, F, and G and Class III hazardous atmospheres (NEMA 7 & 9). Raintight (NEMA 3). Weatherproof features include a drain plug and O-ring seal in cover. Electrical connections are easily made by removing front cover. For convenience the set point adjustment screw is located on the outside of the housing. Twelve models offer set points from .03 to 20" w.c. (7.5 to 5 kPa) and from .5 to 60 psi (0.035 to 3.5 bar). The unit is very light and compact - about half the weight and bulk of other explosion-proof or weatherproof switches with separate enclosures. CAUTION: For use only with air or compatible gases. Applications with hazardous atmospheres and a single positive pressure may require special venting. Service: Air and non-combustible, compatible gases. Temperature Limits: -40 to 140°F (-40 to 60°C); 0 to 140°F (-17.8 to 60°C)for 1950P-8, 15, 25, and 50. -30 to 130°F (-34.4 to 54.4°C) for 1950-02. Pressure Limits: Continuous: 1950's - 45" w.c. (0.11 bar); 1950P's - 35 psi (2.41 bar); 1950P-50 only - 70 psi (4.83 bar). Surge: 1950's - 10 psi (0.69 bar); 1950P's - 50 psi (3.45 bar); 1950P-50 only - 90 psi (6.21 bar). Enclosure Rating: IP64, NEMA 3, 7 and 9. Switch Type: Single-pole double-throw (SPDT). Electrical Rating: 15 A @ 125, 250, 480 VAC, 60 Hz. Resistive 1/8 HP @ 125 VAC, 1/4 HP @ 250 VAC, 60 Hz. Electrical Connections: 3 screw type, common, normally open and normally closed. Process Connections: 1/8" female NPT. Set Point Adjustment: Screw type on top of housing. Weight: 3.25 lb (1.5 kg); 1950-02 model 4.4 lb (2 kg). Agency Approvals: CE, UL, CSA, FM. Popular Models in Inches W. C.